Modelers, particularly those just getting into or returning to the hobby, are often forced to apportion their dollars, pounds, marks or yen between the kits they covet and the references they require. Of course, keep in mind that nothing is truly required. You can build a kit right out of the box if you wish, relying only on the instructions and box art work as your guide. But many of these kits, especially those designed and molded before the early 1990s, are often lacking in smaller details. There may be inaccuracies because the models are based on prototypes that were changed before production, or never went into production (Tamiyas M3A2 Halftrack, for example) or salvaged vehicles containing alterations made during or after the war. Some of the old Tamiya tanks from the 1970s were motorized, and compromises were made in the hull dimensions in order to accommodate motors and batteries. Many modelers, as they seek to challenge their skills (and patience!) will track down references and even copies of old Army technical manuals to determine whats wrong in a kit and how they might make it more accurate. This may require scratchbuilding parts, or buying additional after market sets of resin pieces or photoetched brass or steel. This drive for accuracy can be as confounding as it is rewarding, resulting in a condition we refer to a Advanced Modelers Syndrome or AMS. Its also generally expected that modelers who wish to enter their work in competition will make efforts to improve upon the kit, beyond just building and painting it out of the box (OOTB). Ultimately, its important to remember its up to you how you wish to build your model, and what gives you enjoyment. Ive acquired a hefty number of books over the years, and Ive summarized the best of them below. Many of these can be found in your public library, or obtained through interlibrary loan. At some point youll probably want to own a few of these for yourself. Initial publication prices are in U.S. dollars, and are provided as a relative guide. I've been fortunate to see this impressive tank in person. Fellow Minnesota resident Bob Steinbrunn brought it to a meeting of the Minnesota Military Figure Society and again to our Boots and Treads II show in the spring of 2011. It's an incredible piece of work, taking a 21st Century Toys M5A1 Stuart and turning it into a remote-controlled museum piece. Bob began by stripping the tank apart and then comparing the parts to their historical counterparts. He ended up reconditioning or replacing most of the components, which naturally involved extensive research as well as cutting, drilling, grinding, laminating, scrounging, adapting, vacuforming, wiring, casting, and painting. He documented every step of the way, and this book is a complete account of in text and multitude of photos. Bob provides all of the details so that if one wanted to take on this epitome of Advanced Modeler's Syndrome, he would find this to be a handy instruction manual (Bob even put foundry casting marks an accessory M2 tripod for the .30 Browning machine gun). 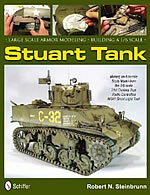 Even if you stay within the modest confines of 1/35, this book will help you trick out the AFV Club Stuart. The 168-page book (provided to me by the publisher for review) includes a bibliography of the modeler's references and resources. This is the book to set out on the coffee table when company comes over. 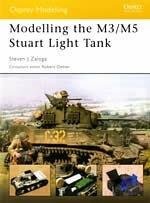 Modelling the M3/M5 Stuart Light Tank, by Steven J. Zaloga, Osprey Publishing, Inc., 2003, ISBN 1-84176-763-8 ($19). These little light tanks were employed by all the major allies during WWII, and with the release of M3 variants from AFV Club and Academy to complement (if not fully supersede) Tamiya's weak M3, truncated M5A1, and creaky M8 howitzer, this book should have wide appeal. Zaloga gives a brief overview of available light tanks before building AFV Club's M3A3 under the French flag. This build is more out-of-the-box, with an emphasis on painting and weathering for a Paris liberation setting. An advanced project combines Tamiya's M3 and Academy's M3A1 kits to offer a Russian version from 1943. This includes some reworking of the rear hull and engine grill. We get to the Americans in a few different workings of Tamiya's M5A1, with much more extensive corrections to the kit's too-short upper and lower hull. In the final section, Zaloga gives some good instructions for a British M3 Honey in Northern Africa, a Philippines M3 in 1941, a U.S. M3A1 and M5 in Tunisia, a Yugoslav M3A3 hull with a PaK 40 gun mounted in place of the turret, and a quick review of his M8 howitzer motor carriage initially published in Military Modelling. The book concludes with a color chart that includes "normal," "scale," and "faded" olive drab paints, as well as British paint colors (presumably "normal" as the other gradients are not offered). 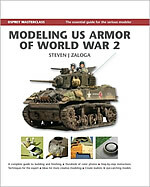 As with all of Zaloga's work, any AFV modeler should find ample inspiration and a good education in this book. 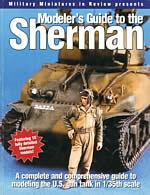 Modelling U.S. Army M4 (75mm) Sherman Medium Tank, by Steven J. Zaloga, Osprey Publishing, Inc., 2006, ISBN 10-84176-965-7 ($19). Zaloga does it again. This time, he walks us down Sherman memory lane with notable kits, beginning with the workhorse M4A3 kit from Tamiya in 1981 up through the company's recent 1/48 offerings, with visits to Italeri and DML along the way. Then he gets into the meat of the book. The first of four featured projects is an early M4A1 from Operation Husky in Sicily, using a combination of Formations, DML, Tamiya, and Tasca parts and RHPS tracks. Very helpfully, Zaloga provides a pattern for the distinctive mushroom-topped wading stack used on these invasion tanks. The next project is more advanced, correcting some upper hull deficiencies in Tamiya's M4 and adding other aftermarket pieces and Warriors figures to portray the familiar photo of a crew from the 8th Tank Battalion, 4th Armored Division, blasting away with the .50 atop the tank heavily festooned with camo foliage. This projects gets a pretty detailed interior beneath all the shrubbery. If you like mine rollers in 1/48 scale, the following project uses Tamiya's quarter-scale M4 and Gasoline's T1E3 mixed media mine-roller set. Zaloga provides a few tech manual illustrations to help navigate the construction. Our final Sherman is a Dragon M4A3(76mm)W hosting Italeri's high-bustle turret and a lot of epoxy putty for some heavy-duty glacis sandbagging and dowel logs hung from the hull sides. The tank is then wrapped with camo netting and topped with some scale pine boughs. Throughout the book the writing is clear and the photos are helpful and inspiring. The book concludes with a color chart and list of referencesincluding a citation for the "handy site" you are now visiting. 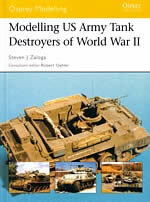 Modelling U.S. Army Tank Destroyers of World War II, by Steven J. Zaloga, Osprey Publishing, Inc., 2004, ISBN 1-84176-799-9 ($19). 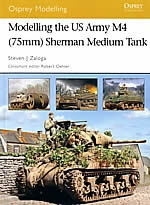 This is another helpful book from the tireless Steve Zaloga, who kicks off the show with an overview of U.S. tank destroyers in both 1/35 and 1/72 scales. His next chapter, on building Academy's M36, takes a slight but welcome detour to examine his detailing of the old Italeri M36B1, based on the M4A3 Sherman chassis. He examines the M36 turrets from Academy, AFV Club, and Tamiya and shows how they all are a bit out of whack. He shows the results of his build of the AFV Club kit, and then goes on to demonstrate a winter camouflage scheme on the Academy model. Then Zaloga makes a visit to the Braille scale M10 from Extratech, giving it ample detailing and figures. On the more advanced skill level, he presents AFV Club's M18 Hellcat, with comparisons to Academy's kit (he prefers the former). Again, we're given a lot of step-by-step detailing, including some figure conversions for the cramped turret. Finally, he demonstrates an impressive reworking of the AFV Club M18 hull into an M39 armored utility vehicle, which was the prime mover for the M5 3" anti-tank gun. The book is full of sharp color photos of Zaloga's handiwork (some taken from extensive articles featured in past issues of Military Modelling), and a color reference chart, that, relying on the fidelity of the printer's ink, gives the actual shades of olive drab "suitable" for various scales, with black camouflage, and weathered. This book has been out of print for some time and even though it's far from complete, it is still eagerly sought out by modelers. An updated version from Ampersand is in the works and keenly awaited by many modelers, including yours truly.